The painting, written by Valentin Serov during the first revolution in Russia “Soldiers, bravo guys, where is your glory!”, Is made of cardboard, gouache and pastels. 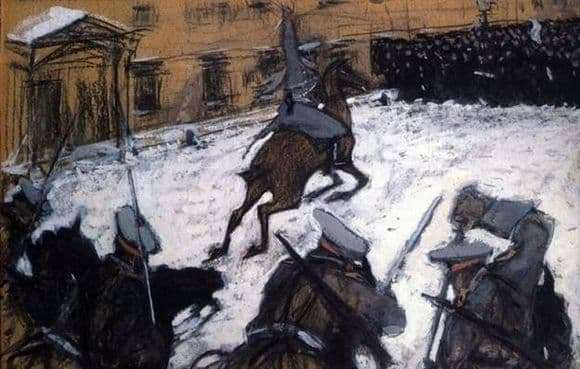 Guardsmen galloping on horsebacks symbolize what happened on January 9, 1905 in St. Petersburg, however, according to some proposals, the dispersal of demonstrators in the current capital is depicted not far from the school of painting, architecture and sculpture. Also, according to one of the common versions, Serov painted the picture from life, being an eyewitness to violence against demonstrators on bloody Sunday. Serov ventured to write an acute satire on tsarism that began revolutionary unrest in 1905-1907. The indelible impression made on the artist the defeat of a peaceful demonstration under fresh slogans. The action that moved the artist to the depths of his soul forced him to give up the honorary right to be a member of the Imperial Academy of Arts of St. Petersburg. It is known for certain that, starting from the nineties of the twentieth century, the artist painted portraits for the royal family, so it can be stated with confidence about the change of his moral guidelines during the first Russian revolution. Sarcastic sounds the name of the picture, reflecting the line from the popular military song: “Soldiers, brava guys…”, selected by Serov. Obviously, the guards, bravo brandishing swords to demonstrators, can not be in the field of approval of the artist. In a letter to artist Repin, Serov expressed his indignation, saying that the sovereign did not express a desire to go to the demonstrators for a meeting, taking into account their demand, but instead arranged violent acts against his own people, choosing the whip instead of gingerbread again. The artist presented his picture made on cardboard to his good friend, Maxim Gorky, together they were part of the editorial board of the satirical journal Zhupel, and after the publication of devastating articles in it, the magazine, of course, was closed.